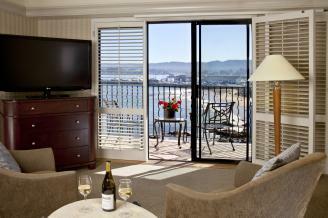 Chart a course for a waterfront escape unlike any other at the Monterey Bay Inn. Alongside a National Marine Sanctuary, in an environment of quiet relaxation and comfort. Unwind in your expansive guestroom with spectacular views from your private balcony, and start your adventure with complimentary continental breakfast delivered to your room before exploring Cannery Row and Monterey Bay. For those couples seeking adventure head out for the day of kayaking, sailing, or pedaling a four-wheel bike all available just minutes from your hotel. When night falls keep the romance high sipping on a glass of wine beside the warmth of the terrace fire pit or beneath the stars in our rooftop hot tub overlooking Monterey Bay. Make your reservation more than 21 days prior to your arrival and receive up to a 15% discount.